Planting cereal crops in the spring for forage is a common practice in Wisconsin when forage supplies are short, hay prices are high, or there has been a high degree of alfalfa winterkill. This Focus on Forage will discuss management considerations for spring planted cereal crops, primarily oats, barley, and triticale (wheat × rye cross). A companion publication, “Cereal Forages for Fall Planting”, addresses considerations for wheat, rye, and winter triticale. Do forage yields differ between spring cereals? Forage yield of spring cereals is affected by species planted, variety selection, seeding date, and time of harvest. When harvested at the boot to early head stage, the three spring cereal species are capable of providing 1.5 to 2.5 tons of dry matter per acre. Variety selection within species has a significant impact on overall yield. This is especially true for oats where a wider range of varieties is available. 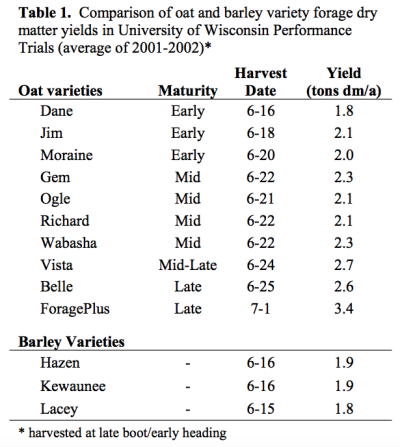 Table 1 summarizes selected oat and barley variety dry matter yields harvested at the late boot stage in the University of Wisconsin trials during 2001-2002. A wide variation in yield potential exists between oat varieties with early maturing varieties yielding the least and late maturing varieties yielding the most. Barley reaches the late boot stage about the same time as early maturing oat varieties. Yields are also similar to early oats. Triticale is similar in yield to barley and early maturing oats. It matures about the same time as a mid-maturity oat variety. What makes ForagePlus so different? ForagePlus is a forage oat variety developed by the University of Wisconsin. From strictly a yield standpoint, it’s in a class by itself. Dry matter yields of ForagePlus are about 25 percent higher than that of the highest yielding standard oat varieties. ForagePlus matures about a week later than late maturing grain varieties and has somewhat lower forage quality (1 to 3 percentage units lower crude protein than standard oat varieties). The lower forage quality can be offset by harvesting in the early boot stage but expect a corresponding decrease in yield. Does forage quality differ between spring cereals? Differences in forage quality are relatively small between cereal grain species when harvested at a similar stage of maturity. Some research and variety evaluation trials indicate significant differences among small grain varieties. For example, the range in crude protein content among oat varieties tested in recent University of Wisconsin trials was 11.9 to 15.6 percent. Early maturing varieties trended toward the higher end of this range. Other research studies indicate that crude protein content of boot-cut cereal forages can range from 16 to 20 percent depending on variety. Nitrogen fertility has a significant impact on crude protein content of small grain forages. What effect does harvest timing have on forage yield and quality? As with most forage crops, there is a yield – quality tradeoff as small grains mature from boot to dough maturity stages. Dry matter yields range from 1.5 – 2.5 tons per acre at late-boot stage to 3.0 – 4.0 tons per acre in the milk and dough stages. Timing of the cereal forage harvest is critical to obtain the desired forage quality. Be alert! The window for harvest is often small for any given stage of maturity and desired forage quality. 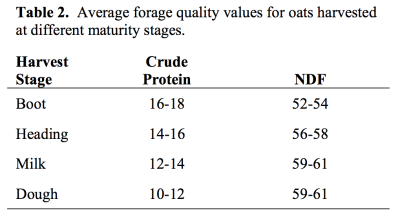 Typical forage quality values of oats harvested at different maturity stages are presented in Table 2. Farm and research experience indicate that cereal forage quality can be highly variable among years and environments. Actual forage quality may be different from those presented in Table 2. Like most grasses, the NDF component of cereal forage is more digestible than that of legumes such as alfalfa. Thus, at similar total fiber concentrations, cereal forages will provide more digestible fiber and energy compared to alfalfa. Optimum harvest timing depends on the type of animals being fed, species planted, and if the cereal is underseeded with alfalfa. For lactating dairy cattle, cereal forages need to be harvested as the first grain heads appear in a field (late boot stage). This provides a feed with more energy and similar protein levels to late-bud alfalfa and similar energy but a higher protein content than corn silage. If used as a companion crop, early harvest of a small grain reduces competition with the legume and will allow for an extra alfalfa harvest before September 1st. If the cereal is going to be fed to heifers or dry cows, producers may elect to wait until the crop reaches the milk or early dough stages. This will provide adequate nutritional value while significantly increasing dry matter yields. Triticale grain heads become unpalatable to livestock as they mature. For this reason, never harvest triticale later than the milk stage. Where cereal forage is being substituted for alfalfa haylage or corn silage, consult with your nutritionist to make appropriate ration adjustments. For example, cereal forage will provide less calcium in the ration than alfalfa. Because there is a wide variation in cereal forage quality from factors such as variety planted, fertility, harvest timing, and environment, always perform a feed analysis before making any ration adjustments. Is there an advantage to planting field peas with the small grain? Small grain/pea mixtures are often grown on Wisconsin farms to increase forage yield and protein levels. For details about this management alternative, refer to the Focus on Forage companion publication “Pea and Small Grain Mixtures”. What are the recommended production practices to maximize cereal forage yield and quality? Varieties differ in yield potential, forage quality, and maturity. Generally, producers will need to make tradeoffs depending on the individual situation. Many of these considerations have already been discussed. Forage yield and quality information is summarized annually in UW-Extension publication A3397, “Small Grain Varieties for Grain and Forage in Wisconsin“. Optimum soil fertility is needed for high forage yields and quality, to insure a good stand, maintain stalk strength, and maximize disease resistance. 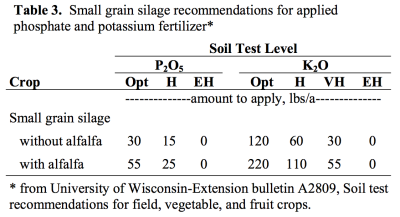 The amount of phosphorus as P2O5 and potassium as K2O needed depends on soil fertility level and if the small grain is being used as a companion crop for alfalfa (Table 3). Nitrogen plays an important role in cereal forage quality, especially protein content. However, too much nitrogen can be detrimental from the standpoint of increased lodging potential and risk of plant nitrate accumulation. If seeded without a legume crop, apply 40 lb/a of additional nitrogen fertilizer to the cereal forage. Cut this amount in half (20 lb N/a) if seeded as a companion crop. Where manure was applied to the field either the previous fall or prior to seeding in the spring, no additional nitrogen is needed. Optimum seeding rates depend upon species planted, planting date, and if the cereal is being used as a companion crop with alfalfa. Seeding rates are often discussed in terms of bushels or pounds per acre to achieve stands of 25 to 30 plants per square foot. 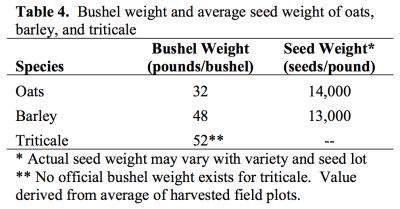 Bushel and seed weights of spring cereals are presented in Table 4. Seed at the lower end of the range for early planting and the higher end of the range for late planting (after mid-May). If alfalfa is under-seeded, lower seeding rates by 30 percent to reduce competition with the legume. “Plant early” if you want maximum yields of spring cereals. This is a long-standing rule of thumb and one that is generally true when grain is harvested but less true when cereals are harvested for forage. 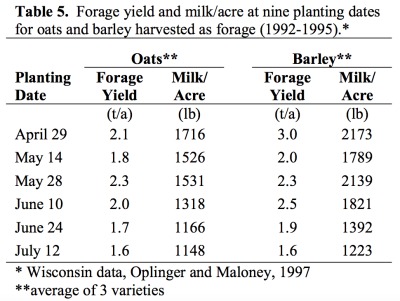 Wisconsin research from the mid-1990’s is presented in Table 5. Ingeneral, the highest milk/acre was achieved with the earlier planting dates. However, acceptable forage yields were obtained for nearly all planting dates from mid-April through mid-July. Bottom line: strive for early planting (as soil conditions allow) but late planting for a forage harvest remains an option. Yields from late planting will be more dependent on temperature and moisture conditions. As previously discussed, harvest timing is important to achieve desired forage quality. Depending on temperature and moisture conditions, small grains will advance through the various stages of maturity at a fast pace. Oats, for example, will move from a mid-boot stage to milk stage in less than two weeks. Small grains cut in the boot stage will be over 80 percent whole plant moisture. Wilt the crop to between 55 and 65 percent moisture depending on the type of storage unit. Harvesting small grain silage that is too wet will result in an undesirable fermentation causing a high pH and high levels of butyric acid. Grass silages often respond favorably to silage inoculants. Small grains have been successfully harvested and stored in conventional upright silos, bunker silos, silo bags, or as high moisture large package bales. Forage can also be harvested as dry hay but wilting time will be considerably longer and at a higher risk to rain damage. Spring-planted small grains are well adapted to Wisconsin’s climatic conditions and can offer good yields of high quality forage in a relatively short amount of time. As a legume companion crop, they compete well with weeds and reduce soil erosion on vulnerable soils. Although dry matter yields are less than that of alfalfa or corn silage, spring small grains offer dairy producers a good forage alternative in years of short forage supply. When cut in the boot to early heading stages, small grain forage is high in energy and protein. Follow recommended agronomic practices to obtain maximum yields and forage quality.